The United States’ Carter Centre on Wednesday proposed that the Guyana Elections Commission (GECOM) activates existing legislation to remove the names of overseas-based Guyanese from the voters’ list, a move that could pave the way for General and Regional Elections to be held in August 2019. “This has surfaced and what the Carter Centre has sought to do is to see how they can work around this to come up with a compromise. Their compromise does not fit neatly into what the law provides for. They have suggested that a list of non-resident people could be generated and could be used on election day to determine whether anybody came to vote for them so they are attempting to address the essence of the matter, that is, substitute voting,” ruling coalition commissioner Vincent Alexander told reporters. This latest development came one day after GECOM Chairman James Patterson wrote President David Granger informing him that the Commission would be ready for general elections in November 2019 after house-to-house registration and that GYD$3.5 billion would be needed to conduct the polls. 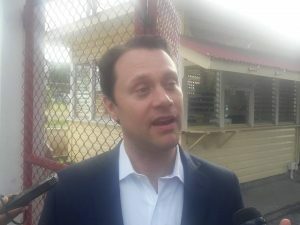 Jason Carter of the Carter Centre called the meeting with the GECOM Commissioners “very productive” and “there was a genuine exchange of ideas”. “There is a lot of political desire to reach a solution”. Carter, whose grandfather is former US President Jimmy Carter, said Guyana’s political leaders now have to decide. “I think ultimately our role here, of course, is limited. We are not Guyanese, we care about this country… Ultimately, the issues that are being confronted right now are going to require the cooperation of the political leadership of this country and we are optimistic,” he said without taking questions from the media. Alexander said the Carter Centre suggested that the National Registration Act that allows for the removal of emigrants from the voters’ list be used by the Commission. However, he said if they are in Guyana at the time of continuous registration, they could apply to be replaced on the list. “There is a mechanism by which the list could be cleansed of persons who are resident overseas, not interfering with their constitutional right because the same regulations would permit them, if they wanted to be involved in the elections, to be home at the time of claims and objections to get their names back on the list,” he said. Alexander said the process would require collaboration with the Department of Citizenship and Immigration Services to remove the names of permanent residents or those who have been outside of Guyana for more than three months. However, he could not say how long that process would take. While Alexander said he was still very much in favour of house-to-house registration which would conclude in November 2019 by which time the President could name a date for Guyanese to go to the polls, he was willing to consider the Carter Centre suggestion. “I am not unprepared to explore the possibility of using the law that already exists but needs some regulations for it to be operationalised,” he said. The three-member Carter Centre team held more than two hours of talks with the seven-member Commission. Asked what would be done to remove the names of deceased persons, Alexander said that was never his major concern. “I have never said deceased is the major issue. The major issue for me has always been the question of the bloated list, the majority of whom I am sure are Guyanese who are overseas and who are not resident,” he said. He said the General Registrar’s Office was responsible for providing information on registered deaths to GECOM so that those names could be removed. Opposition PPP elections commissioner Sase Gunraj, without going into details, confirmed that the proposal would entail bringing forward the election date. Guyanese look set to go to the polls earlier than next year due to the passage of the no-confidence motion on December 21, 2018 by 33 to 32 votes in the 65-seat National Assembly. Chancellor of the Judiciary Yonette Cummings-Edwards on Wednesday announced that the Court of Appeal would be delivering its three related decisions on Friday – the day after the expiration of the 90-day deadline by which general elections should be held following the National Assembly’s passage of the no-confidence motion. Opposition Leader Bharrat Jagdeo as late as Wednesday reiterated his claim that the three ruling coalition elections commissioners and the GECOM Chairman have conspired with the governing coalition to deliberately delay the holding of general elections within the three-month period. The PPP has said that nothing is wrong with the list because only four months ago it had been used to run off credible Local Government Elections with no major complaint by any of the contestants. However, the coalition and its three elections commissioners have consistently maintained that only house-to-house registration could be used to scrub the list of emigrants and deceased persons.